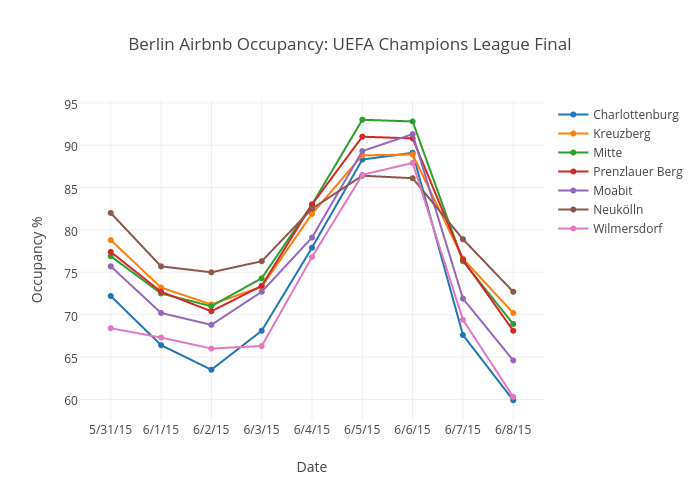 Kambain's interactive graph and data of "Berlin Airbnb Occupancy: UEFA Champions League Final" is a scatter chart, showing Charlottenburg, Kreuzberg, Mitte, Prenzlauer Berg, Moabit, Neukölln, Wilmersdorf; with Date in the x-axis and Occupancy % in the y-axis.. The x-axis shows values from -0.4941808415398388 to 8.494180841539839. The y-axis shows values from 57.78632197648934 to 95.11367802351066.